View from the pool: SP 8439 and 8914 lugging the beet racks towards Tracy; Merced CA, August 1979. 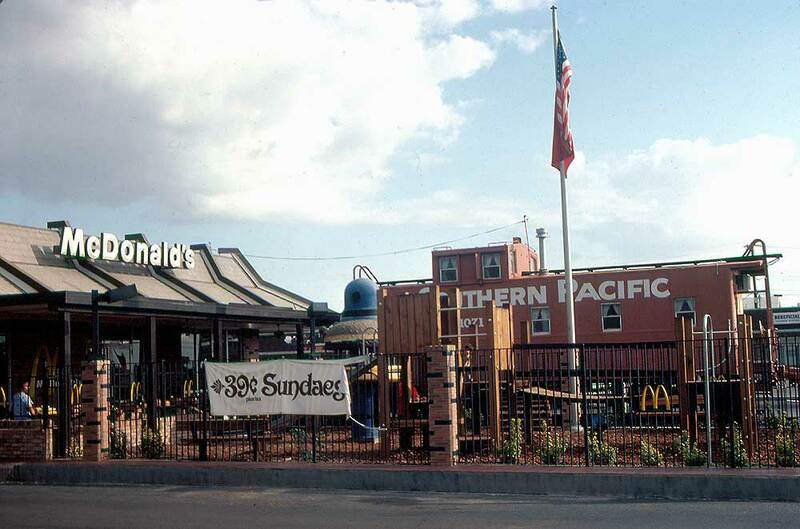 Southern Pacific suffers a Big Mac Attack; El Paso TX, September 1983. 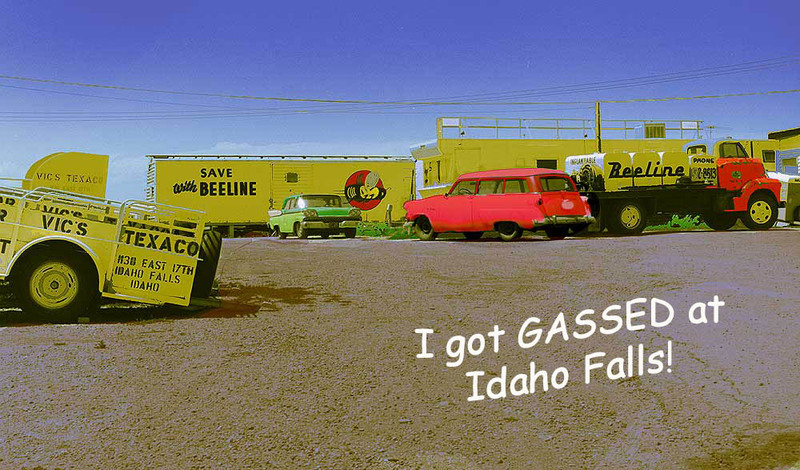 Cheesy postcards are an integral component of roadside lore, so Wx4 technicians created this drug store quality virtual card from a staff photo taken in June, 1965 next to the UP main at Idaho Falls. 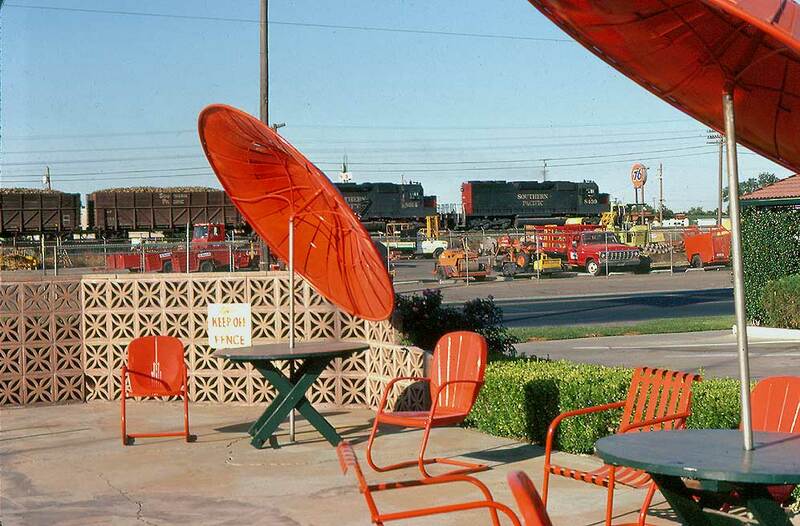 During the Depression, railroads and trolley car diners suffered from the same problem: how to attract customers in the new Flash-Gordon era of modernism. Art deco (the last decent visual design style, my two cents says) was all the rage, and what few railroads whose finances did not depend upon selling pencils on street corners experimented with primitive streamliners conceived in a Art-Deco-goes-to-Mongo style. 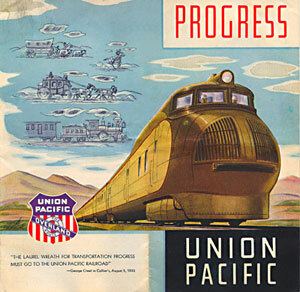 Union Pacific's M10000 (whose five digit number was itself impressive in a four digit railroad world) was a pioneering effort in that direction. 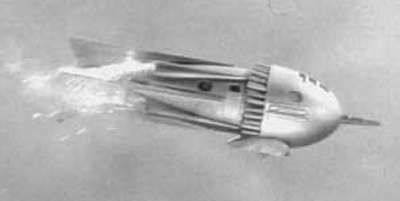 Design-wise, it resembled a battleship turret plopped upon a 1931 Alpha Romeo, but never mind, UP management thought it was the cat's meow. At the same time, a multitude of roadside diner owners moderated their startup costs by utilizing cast-off trolley and interurban car bodies, which were becoming as numerous as the flies within them, since so many electric railways were biting the dust. Others used wooden passenger cars that once carried troops to the Indian wars. During the Depression theses econo-diners tended to be quite seedy, and thus ltended to attract clients who only could afford to smell the food. What to do if one wanted to cater to a better-paying class of customers? Well heck, grab a few dozen hods of stucco and have a go at imitating an imitation of evil Emperor Ming's flagship. Above is the unique result that once sat alongside U.S. 395 near Perris, California. It was known as the Streamline Diner - an 80% misrepresentation - until it closed in 1943. After it reopened in 1948, it was called the Liberty Bell Diner - a 100% misrepresentation, but it closed for good in 1982. Above we see it as it looks today in genteel retirement, after being rescued and moved to the Perris grounds of the Orange Empire Railway Museum. Though the results were goofy, the cafe's Flintstones-like stucco-art was hardly atypical of times that also produced giant plaster steers, dinosaurs and clams. We have no reports regarding that brooding face's ability to encourage pre-meal appetites and to aid in post-meal digestion. At any rate, I'm not sure that MCDonalds, Arbie's & etc, are worthy (or tasty) replacements. 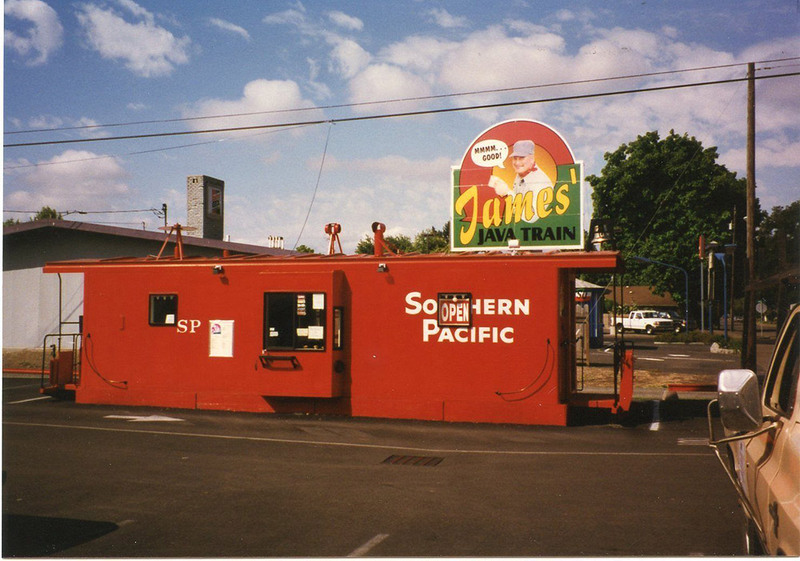 A study in minimalist decoration - James' Java Train, Junction City, Oregon, 1997: Presumably James forswore extra decorative bling because he is a man of taste who didn't want his operation to be the downtown's architectural sore thumb. Or, maybe his budget simply derailed upon the bill for that fine sign, presumably a likeness of Engineer James, himself. We know that, in real life he is not an engineer, because he is smiling.